Concurrently with Lagos, a consulate was established in Old Calabar, a port near the mouth of the Cross River in the axilla of Africa, in 1853 when responsibility for the Bight of Biafra was hived off from the consular district of Fernando Po. The site was owned by Efana Efana, otherwise referred to as Chief Duke Henshaw or Chief Henshaw III. Additional, immediately surrounding land was leased in 1887. The buildings that were erected were handed over in 1891 to the Oil Rivers Protectorate, which had been established by Britain over the Niger delta area in 1885 and became the Niger Coast Protectorate in 1893, with Calabar as its seat of government. Capital of the Eastern Region. Deputy high commission offices were built by the Ministry of Works in 1960 on Garden Avenue, on which a 99-year lease was bought in 1960. Two staff houses were leased [? or built] in the Ekulu Layout at 42 Emole Avenue and 2 Bent Lane, and there were four flats at 41 Emole. Land adjoining Old Government House was taken on a 99-year lease in 1964 as the site for a new residence, but never built upon and subsequently given up. The Post was temporarily closed in 1968 during the Biafran war but never re-opened. Capital of the Western Region. Offices were leased in the Finance Corporation Building in Lebanon Street. The British government in 1958 accepted the Western Region government’s offer to grant a 99-year lease from 1960 on a four acre site on Rotimi Williams Avenue, in the Bodija housing estate, and erect a house on it for the British representative in Ibadan. The house was completed in 1963. The Post closed in 1980. An outpost of Kaduna in the Northern Region, reliant upon leased premises. 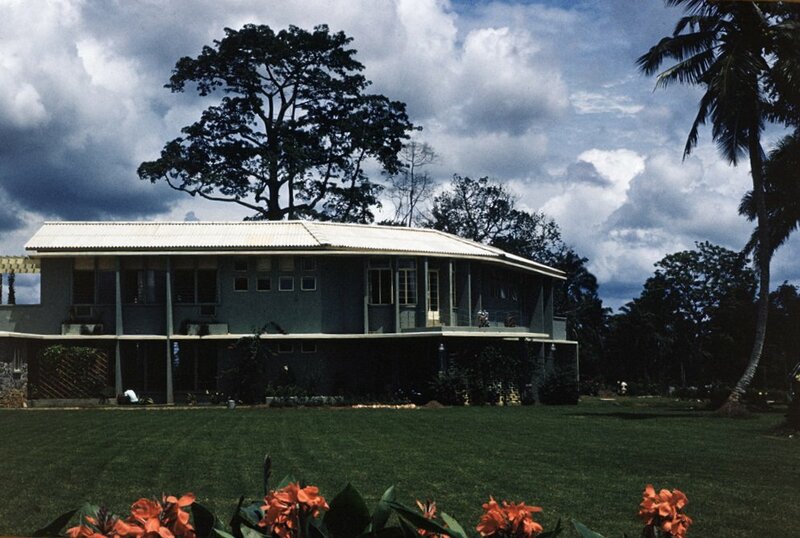 DHC residence in Ibadan, 1969. DHC residence at 3 Independence Way, Kaduna, 1991.